for 99 Days to Date. 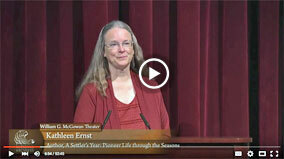 A Settler's Year is Kathleen's second work of non-fiction, and her thirty-second published book. 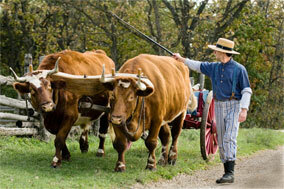 This page provides a rich mix of background information about the book and its roots at Old World Wisconsin. A Settler's Year: Pioneer Life Through The Seasons provides a rare glimpse into the lives of early immigrants to the Midwest. 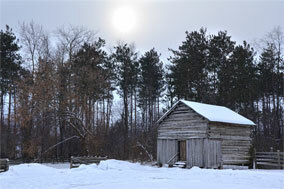 Evocative photographs taken at Old World Wisconsin, the country’s largest outdoor museum of rural life, lushly illustrate stories woven by historian, novelist, and poet Kathleen Ernst and compelling firsthand accounts left by the settlers. Here we discover the challenges and triumphs found in the seasonal rhythms of rural life in the 19th and early 20th centuries. As we turn the pages— traveling from sprawling farm to tidy crossroads village and from cramped and smoky cabins to gracious, well-furnished homes— we experience the back-straining chores, cherished folk traditions, annual celebrations, and indomitable spirit that comprised pioneer life. At its heart A Settler’s Year is about people dreaming of, searching for, and creating a new home in a new land. This moving book transports us back to the pioneer era and inspires us to explore the stories found on our own family trees. This book features the beautiful photographs of Loyd Heath, and is available in hardcover and e-book versions. Use the FIND THE BOOK link below to see a list of booksellers that it can be ordered from. Named to the 2015 list of 52 books "representing the literary heritage of the 50 states, the District of Columbia and the U.S. Virgin Islands." This twenty year series features books that reflect the holdings of the National Archives, which include the Wisconsin land applications submitted by settlers under the 1862 Homestead Act. "...when the word immigrant is flung about in political discourse like a swear word, "A Settler's Year" is a gentle, visually engaging reminder that just a few generations ago, nearly all the people living in Wisconsin came from somewhere else — and made a new life here through hard work and the support of their neighbors." Melds "exemplary text, design, and artwork." Enjoy the author's insights about the story, characters, and settings. Note: additional blog posts will be added during the fall of 2015. There are few topics I feel as passionate about as the lives of early immigrants. For three decades I've been researching and interpreting them, creating museum events and television programs about them, and writing articles, poems, and books about them. 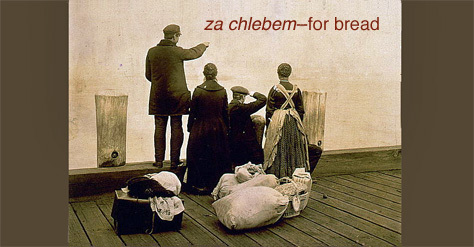 At its essence the immigrant experience is about people searching for a new home, in a new place. That journey has meaning for almost all of us—whether in our own lives, or those of our ancestors. 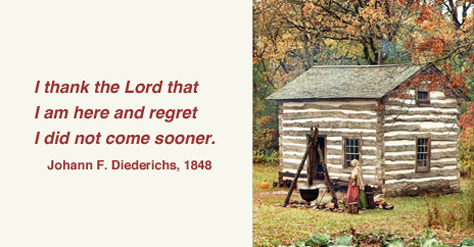 A Settler’s Year combines immigrant quotes, and evocative photographs of Old World Wisconsin taken by Loyd Heath, to transport armchair travelers to both the modern site and the not-so-distant past. Perhaps it will also inspire you to gather and preserve stories of your own family or community. 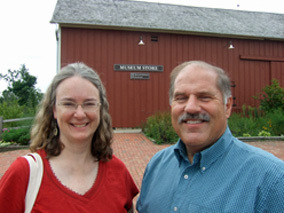 A Settler’s Year is dedicated to my former colleague and friend Marty Perkins, curator, who devoted his entire 34-year career to Old World Wisconsin. Marty did it all: dismantling and restoring buildings, fieldwork, educational planning, outreach. His greatest love was research. He knew that all history programming must be based on a foundation of facts. Marty was developing the proposal for A Settler's Year when he passed away unexpectedly. I had the great honor of being invited to step in to make sure that his dream became a reality. Marty left us all an enormous living legacy at Old World. He will always be missed. The photos in the book were all taken at Old World Wisconsin, a large outdoor living history museum that you can visit from May through October. 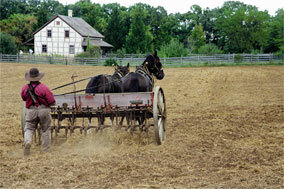 Old World is located just outside the rural Village of Eagle in the Southeast corner of the state. Click on the Google map above for a close-up view. 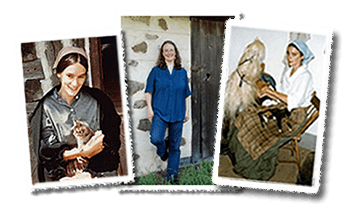 Here is a very small sample of the many beautiful photos—all of which were taken at Old World Wisconsin—that illustrate A Settler's Year. Click on any image to see larger versions, with descriptions. Visiting Old World's crossroads village and working farms will help you discover more about the diverse European, Yankee, and African-American immigrants who settled the state in the 1800s. 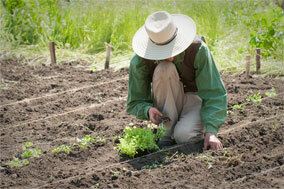 Wander the site, chat with the costumed interpreters, and take in the daily activities of pioneer life. Thanks to the magic of digital media, you can watch and listen to me discussing A Settler's Year whenever you want. US National Archives Noon Lecture. Broadcast by NARA and C-SPAN3. 46 min. 46 sec. October 19, 2015. But wait, there's more. The publisher has created a Pinterest board about this book. Access it by clicking on the logo below. A Settler's Year is available from these and other booksellers as a 200 page hardcover and in digital e-book versions. You can request a signed and personalized hardcover copy from me by clicking HERE.